It’s getting SO chilly here in SoCal, which means I can finally break out all of my jackets that I love oh so much! 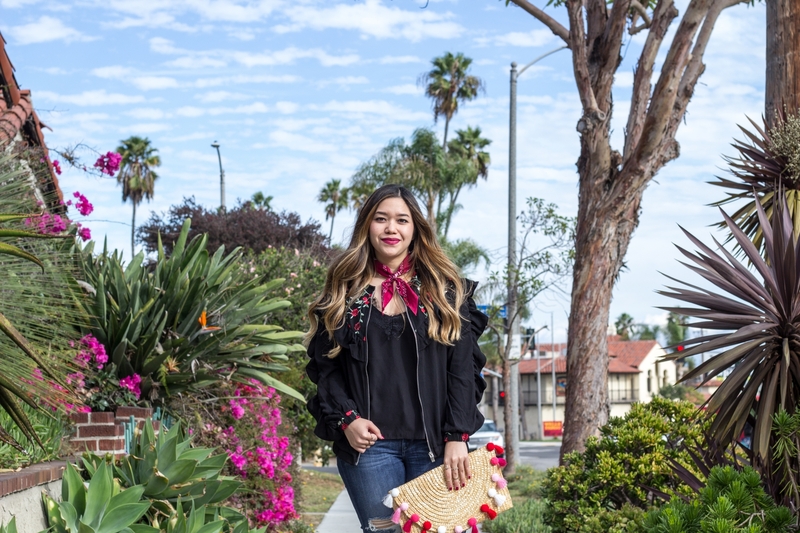 I recently picked up this gorgeous ruffle embroidered bomber jacket and I’m seriously IN LOVE!!! 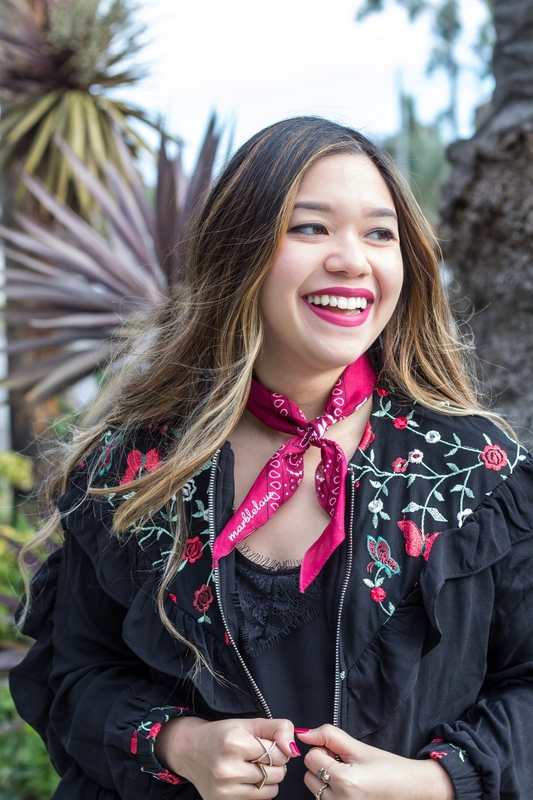 First of all, this ruffle embroidered bomber jacket is only $31!!! YAY for affordable finds!! You can get it here. Second of all, how gorgeous are all the floral embroidery throughout??? 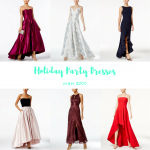 I love love love the ruffle and frill trim throughout the sleeves, neckline, and the back. 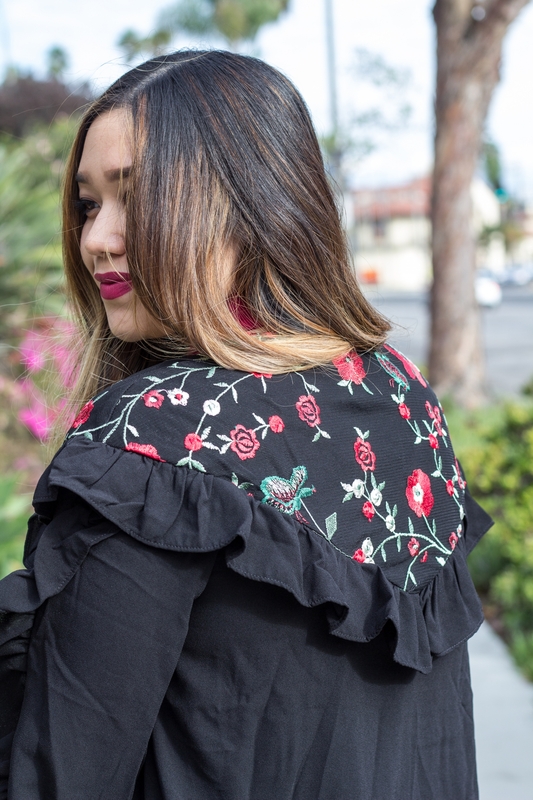 I also love how unique the back is with the combination of the embroidery and ruffles. 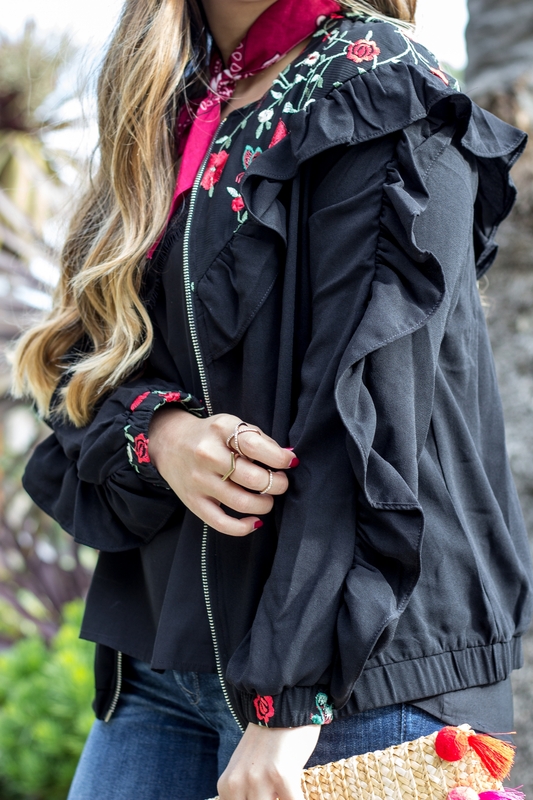 For reference, I’m wearing a small in this ruffle embroidered bomber jacket and the fit is perfect. 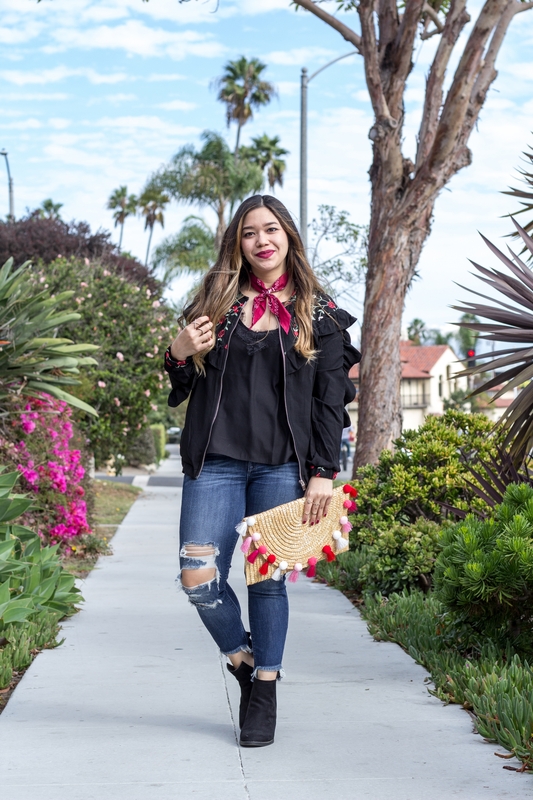 I decided to pair my ruffle embroidered bomber jacket with my personalized bandana to really bring out the red in this whole look. My custom bandana is $24 and comes in 13 different colors to choose from. You can also choose your thread color! 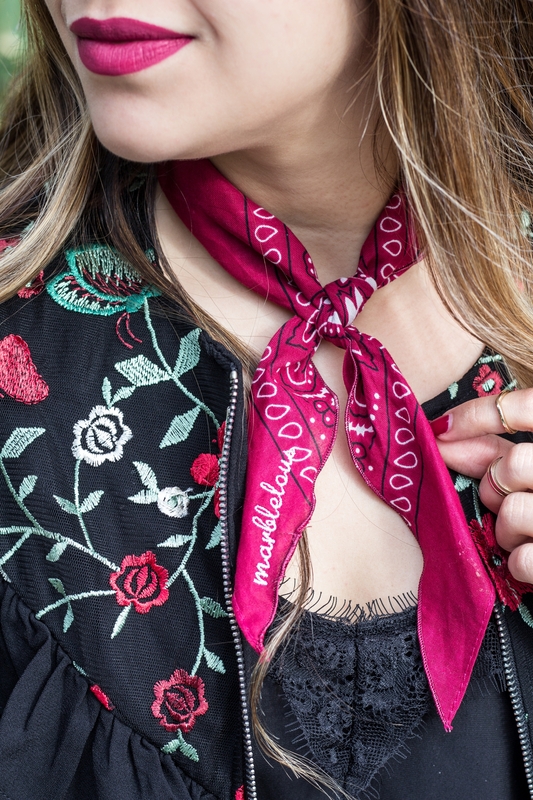 I customized my red bandana with “marblelous” but you can choose whatever name, word, or phrase you want! My eyelash lace cami is only $10 and I’m wearing a medium, but I should have ordered my usual small because it is TTS. My cutout slit booties with chunky block heels is $90 and is SO comfy! It also comes in taupe and cognac. How cute is this pink straw pom pom clutch? I’m seriously OBSESSED with it and I thought it accentuated the pops of red from the ruffle embroidered bomber jacket really well. It’s only $38 and ships free! 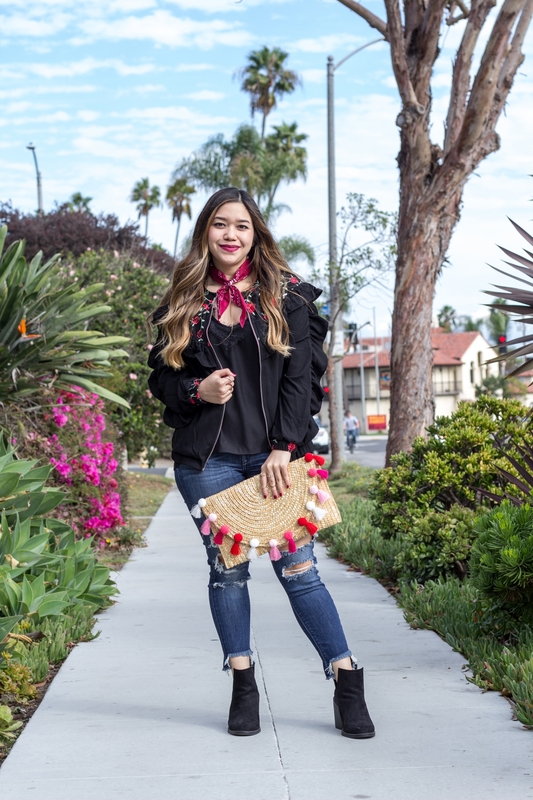 What do you think about this ruffle embroidered bomber jacket? 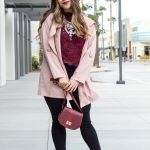 Do you love layering your outfits with jackets as much as I do?